Q: In conducting research on learning, what did you learn about what motivates young people? A: Just as with us adults, their first sparks of interest come from lots of different sources. They might admire something that they see someone else doing, for example. It could be the activity itself—or it could be the desire to be with (or be like) the person they admire—that makes them want to do that thing, too. Still, our wishes don’t turn into the motivation to try something unless another key factor is present. To turn that spark of interest into a fire, young people have to expect that they can do that thing, if they try. They need someone to encourage them to mess around with it a bit, explore its possibilities, take those first shaky steps without fear of humiliation. Opportunity and encouragement are the key supports that adults can provide to help young people develop the skills and strengths that will help them thrive at home, in school, and in later life. Just giving kids the chance to watch accomplished people do things opens doors of opportunity. And if we follow up by providing a supportive situation where they can try such things themselves, we create a magical combination. Q: Why is it important for young people to have the experience of being really good at something? Is this what you mean by mastery? We looked at the many things that they could already do well—making music, making robots, even making it safely home through a rough neighborhood. And we discovered that “getting good” has certain common elements that always show up, no matter what knowledge and skills you’re working on. Q: What did you learn about the process for kids to actually master something? A: Whether kids are learning how to skateboard or how to speak a foreign language, they’ll have to try it again and again before getting it right. They’ll have a lot of frustrating moments along the way. And if they have someone coaching them step by step . . . if each step is not too easy, but not unrealistically hard . . . and if they stick it out and keep practicing—they will feel the satisfaction of mastering a challenge. The wonderful thing about that? Learning is never finished. They can use the process again and again, in everything they try. Mastery is a lifelong journey, not a goal—and its habits start young. interest in math and science. Baltimore public schools recently issued the results of their summer program offered in 2010. The summer program was wildly successful in attracting and retaining students - attendance increased by 3,000 over last year, with middle school enrollment climbing from 300 to 2,000 and boasting an 85% attendance rate. Summer students also showed dramatic academic gains. "In the new program, elementary school students noted double-digit percentage-point gains in language arts and math tests taken at the beginning and end of the summer; more than 60 percent of middle-schoolers who participated in newly created summer programs retained or gained skills; and more high-schoolers passed their high school assessment courses," wrote Erica Green in The Baltimore Sun. So what made the difference in the success of the 2010 summer program? (The answer would come as no surprise to those who support the Learning in Afterschool principles.) They moved from a "remedial, punitive model, to highlighting the importance of enrichment," said Ashley Stewart, senior director of community initiatives for the National Summer Learning Association. 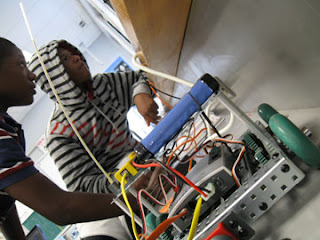 Enrichment included robotics, forensics, and sports. Stewart said many districts' summer programs suffer because they don't understand that "when you create a program that provides academic rigor with things that are fun and engaging, you have a captive audience." To learn more and view the complete article, click here.